It’s that time of year where we start thinking about preparing for back-to-school. 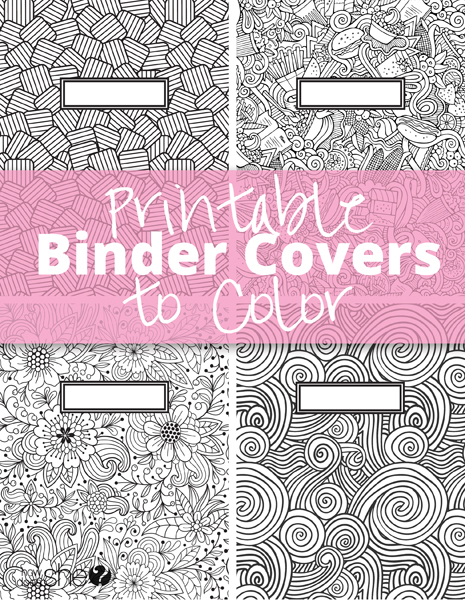 Printable binder covers are something that you might want to consider adding to your list! Last year the week before school started, I was walking the aisles of Target with kids in tow picking up supplies. It seemed as though every list my kids had indicated they needed a clear front binder. My daughter had her eyes set on a fun striped binder with glitter – but sadly there was no clear front. She settled on a navy binder with a pop of color on the inside. 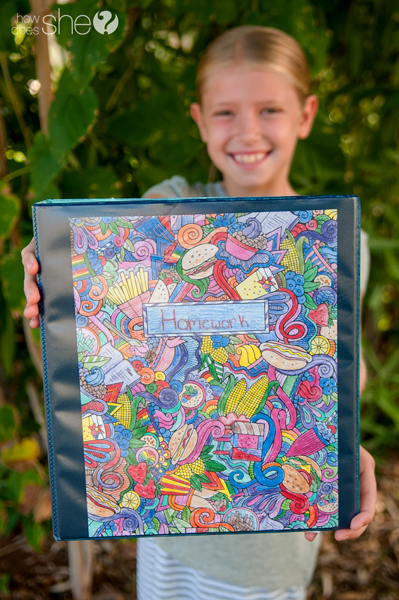 I convinced her we could make it fun with a printable binder cover that she could color! What’s more fun than creating your own art?! I printed out several binder covers for her to choose from and she got to work coloring. I was surprised by the fast food design she chose – I was sure she would choose the flowers. She told me she would be coloring all of the printable binder covers and would switch them out when she wanted something new. I’ll make a hundred different designs if that means she’s okay with the boring blue binder! We go through binders like CRAZY!! Stock up on these Amazon Basics ones – they are perfect for the printables and you can’t beat shipped to your door for FREE with Amazon Prime. This is a good price for customizable binders. Twistable colored Pencils = NO SHARPENING!! The. Best. 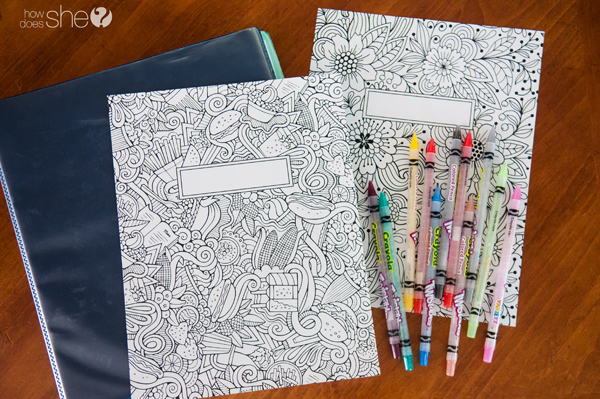 Download our free printable binder covers to color and let your kids start creating their own art. 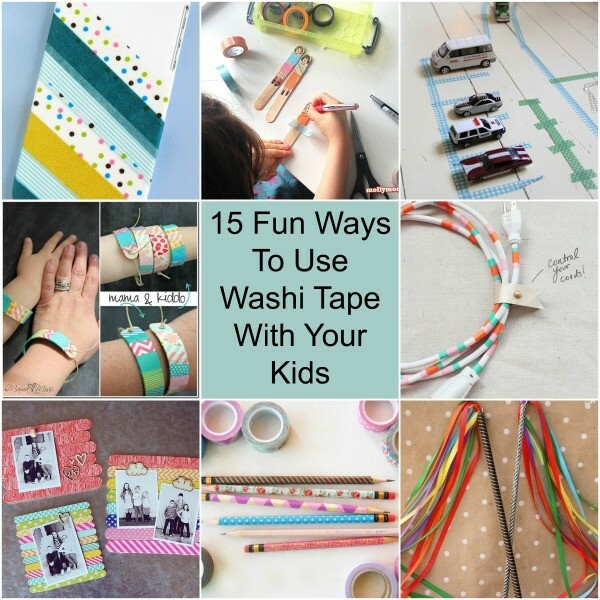 We’ve got a lot of fun ideas for getting creative with your kiddos. Have you ever tried these fun, crafty, and kid-friendly ideas? Thank you for these! I’ve been looking for this exact thing for a couple weeks now after encountering the exact same conundrum. Problem solved and my kids will be thrilled. How can I print it? If you scroll to the bottom of the post there will be a link that says free pdf download. Click on that to download then print. Absolutely adorable!! Thanks for sharing!! Would someone be able to help me? When I printed out the covers, they were black with white lines (the opposite of what is shown on the website). The covers are beautiful and my two artistic granddaughters would really love them. Thank you. Great Design! Can you make More Please!!!!!!!!!!! !